From a Nissan Press Release. I am not a huge fan of Super GT running a V8 car. It obviously worked out for them, as they won the championship. I would rather see the VR38 or derivative in the car. Round 9 of the 2008 SUPER GT took place at Fuji Speedway (1 lap: 4.563kms). In light rain, the CALSONIC IMPUL GT-R (No 12 Tsugio Matsuda/Sebastien Philippe), which started on slick tyres after qualifying in twelfth position, took the win. In the series points' battle, the Xanavi NISMO GT-R (No 23 Satoshi Motoyama/Benoit Treluyer) finished 9th, netting the series' championship title. Making its debut this year, the NISSAN GT-R took seven victories from nine rounds, and in the process won the Driver's Championship Title. Amidst thick clouds, 47,100 fans gathered to witness the title-deciding race. At 2:00pm, low-hanging clouds emitting sprinkles of rain made it a gamble for teams trying to make the optimal tyre choice for the start. Many teams expected conditions to deteriorate, thus choosing intermediate tyres. However, TEAM IMPUL principal Kazuyoshi Hoshino insisted on installing slicks. "I based this decision on my many years' experience racing at Fuji. Matsuda just needed to be patient for the first five laps," he said. Soon after the race started, the rain stopped and water drained off the circuit, as had been expected. Therefore, a lot of teams had to make several pit stops for tyre changes. By the sixth lap, Matsuda in the No 12 GT-R had risen to 2nd place. Thereafter, the No 39 Lexus SC430, which had been running top, was caught and passed on lap 17. Matsuda then held onto the lead, returning to the pits on lap 32 to hand the car over to Philippe. It began to rain again, and Philippe, who had returned to the track on intermediates, immediately ran in the top position. From this point, the team settled down as they were running with a gap of 30 seconds, concentrating on taking their second victory of the season after their win at the 1000-km event in August at Suzuka. From the front row, Oliveira took the start in the No 24 WOODONE ADVAN Clarion GT-R (Joao Paolo de Oliveira/Seiji Ara), but had drivetrain trouble after coming in for a tyre change on lap 3, immobilising the car in the pit garage for 16 laps. On lap 20 the car returned to the race, and finished in 15th place. Choosing to run on intermediate tyres at the start, Treluyer took charge for the first half of the race in the No 23 GT-R. An aggressive drive in the unstable conditions saw him rise as high as third at one point. However, from around lap 18, tyre grip decreased and on lap 22, the car came in for new rubber and a simultaneous driver switch to Satoshi Motoyama. During his long stint, Motoyama returned to the pits for another set of tyres along the way. From that point, he saved his tyres and maintained a constant pace as he ran down the laps. During the latter half he picked up the pace a little, running in 9th place to the flag and earning points. With the 2 championship points for the position, their win in the Driver's championship was put beyond doubt. The No 23 GT-R took a resounding debut win in the opening round of the season, and then followed that up with victory in the 2nd race also. Victory in the race at Auto polis in October (Round 8) made it three wins this season. Satoshi Motoyama returned to the champion's circle for the first time since 2004. The MOTUL AUTECH GT-R (No 22 Michael Krumm/Masataka　Yanagida) finished in 11th, while the YellowHat YMS TOMICA GT-R (No 3 Ronnie Quintarelli/Naoki Yokomizo) ended the race 13th. 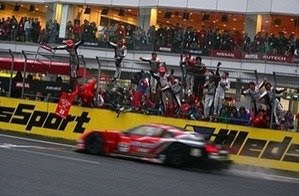 "We were able to score three victories in the new GT-R's debut year. We also took the championship title, so it's really been a fantastic season. Because the weight was heavy in the last race, it was a really tough battle, I never expected Benoit to do so well in qualifying yesterday; I also didn't expect to be competing in rain today. Thank you for your support throughout the year." "The choice before the start to run on slicks was made by Director Hoshino and the team. This meant everything, and it allowed us to take our second victory of the season. Also, to see the No 23 car secure the championship title made it an optimal day. To all the fans who have supported us so strongly all season long, I sincerely thank you. Next season we will surely take the series' championship. Please continue your support for us next year as well." "To have achieved our pledge of winning the series championship is a great relief. Today, while watching the movements of our rival teams we avoided risks and concentrated on fighting for the championship. The No 12 car drove a perfect race today, and the Z captured the GT300 championship title. It's really been an incredible day, and a splendid year. To all our many fans I'd like to extend my sincere gratitude. Thank you very much."